A line of those eager to be wrist-banded for access to unlimited wine giggled and shrilled at the news. While waiting, they weren’t just texting and checking in on Facebook, they were previewing what was available to drink on the Wine Riot app. “I want to try this” and “I want to try that” was overheard. 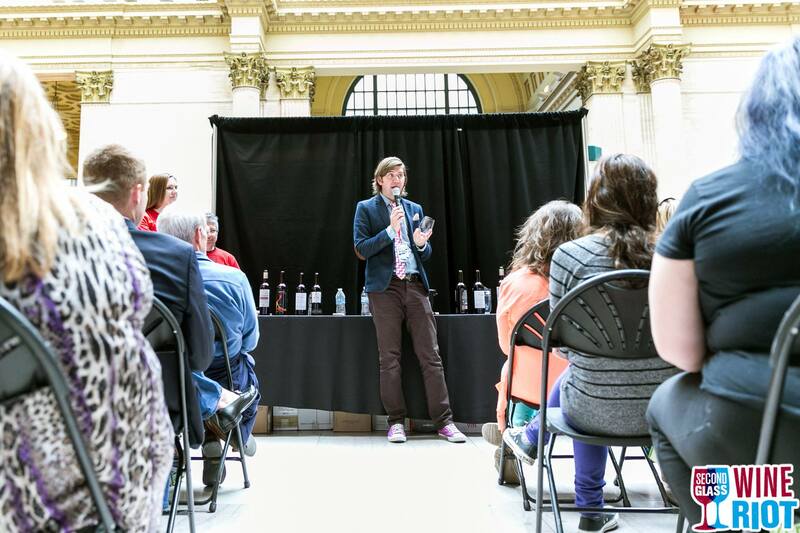 All these folks packed the Great Hall in Union Station for something called Wine Riot. It’s organized by Second Glass, a name suggesting not just gratuitous consumption but the idea that it takes more than one glass to learn. “It was amazing how they transformed this place overnight,” said volunteer, Chris McCallum. “[Wine tastings can be] sit down and stoic, [but here] you’re in a club-type atmosphere,” he added. But not a lot of people are learning in a club. This wine tasting event included a DJ playing tunes to move your feet, a temporary tattoo booth where you could get a sailboat or pretty lady with curly hair on your right bicep, a photo booth with props to take pictures and laptop readily available for patrons to share pics on Instagram. The average age of Wine Rioters is 29, according to Second Glass co-founder and CEO, Morgan First. 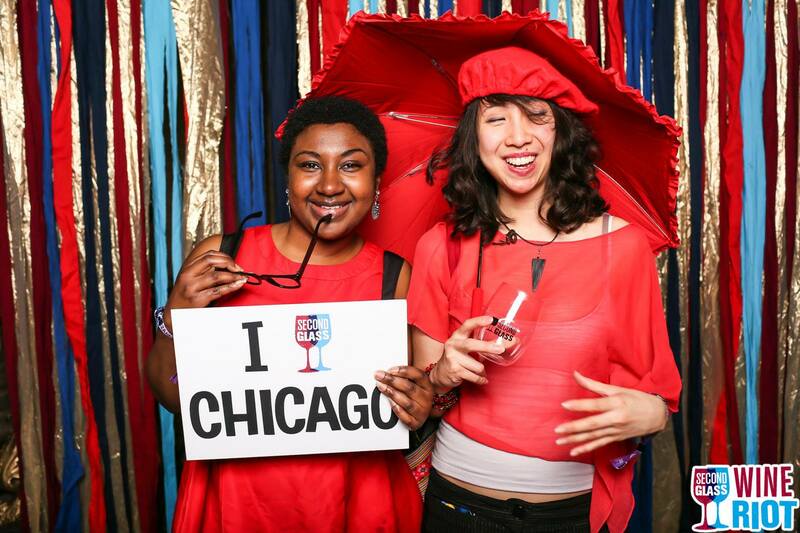 She and Tyler Balliet, Second Glass co-founder and President, had 2,700 people attend their Chicago Wine Riot, which is their 25th overall in six years. Other locations have included Boston, LA and New York City. “The whole idea is to show people the world,” said Balliet. Balliet began these events with hosting only thirty people. The first big one was in Boston. As a former wine store worker, he said most ways to learn about wine seemed expensive, somewhat boring, and too overwhelming with information. “I got frustrated because I couldn’t find small amounts of information. So I said, screw it. I’ll start my own event,” said Balliet. The result is that patrons can attend Wine Riot. 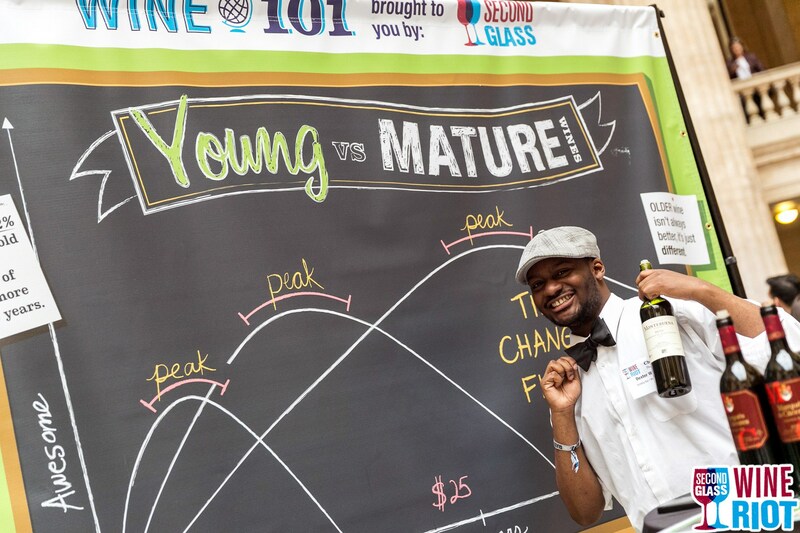 Aside from the crash courses, there’s a smattering of booths all over the event space including Wine 101, a four-sided booth, with categories including Young vs. Mature, Sweet vs. Dry, Oaked vs. Unoaked, and New World vs. Old world. Opposite from him was Jamie McNee, stationed at the “Oaked and Unoaked Wines” booth. “I think there’s lot of snobbery and a hierarchy to wine that’s not really necessary, because wine is just like beer. A good wine is wine you like,” said McNee. The landscape of wine drinkers has changed. On April 8th, Piper Jaffray released a study called, “Taking Stock With Teens: A Collaborative Consumer Insights Project.” It’s 60 pages long and covers the consuming habits of teens. From this, the media picked up one major takeaway: For the first time, teens are spending more money on food than clothes. It’s not a shocker because teens aren’t the only ones. Millenials, Gen X and Gen Y – they all seem to be sharing in this trend, but younger people seem to be more impassioned. Everyone is becoming more and more involved with what they eat and drink. With wine being one of the most complicated things we consume, our fascination with it mirrors that complexity. Balliet also addressed the most daunting issue: wine tasting for an event with over 200 wines to taste. “Try things you never heard of! We have so many wines. Why try wines you only like? Try something you never heard of and find your new favorite wine,” he added. “Be aware of the fact that 1oz. pours seems like nothing in your glass, but ten of them is a lot,” added First. There were spit buckets at each vendor station, a nice reminder that you didn’t need to commit to a full swallow. Attendees were also able to share what they like and didn’t and take a list home with them, if they had a smartphone. This idea of remembering what you taste seems to be a crucial component of what Second Glass is trying to do, and phone apps seem to be made for such lofty goals. The top three wines for this weekend, according to the app were: NV Casa Vinicola Zonin S.P.A. Prosecco ($14.99), Bonfire Wines Ember ($16.99) and NV Scharffenberger Brut “Excellence” ($19). 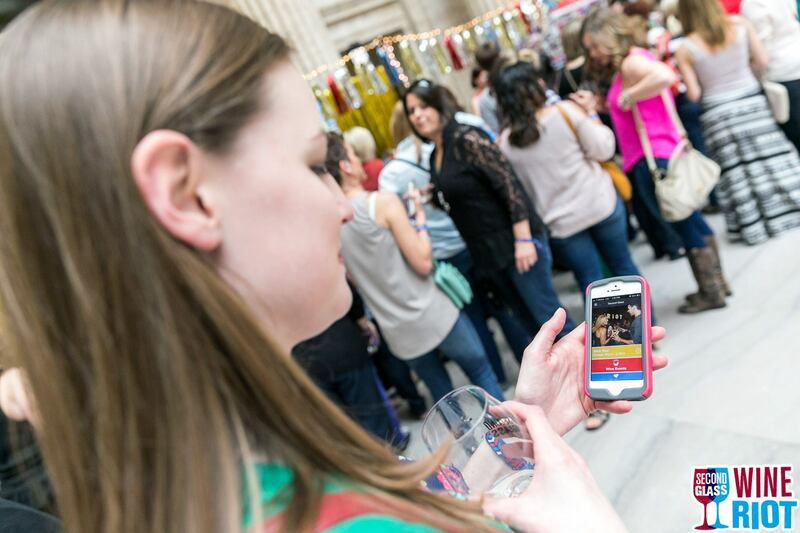 Modern technology has been the backbone of promotion for Wine Riot. “Social media, especially Facebook, is our main source of promotion,” said Balliet. Social media cues were even in the ladies room with hashtag stickers of #wineriot plastered on the mirrors. Outside of the stalls, photo booths provided access to Twitter accounts so patrons could post their photo booth pics. The cost to attempt to experience all 250 wines and Tweet about it later was $60. 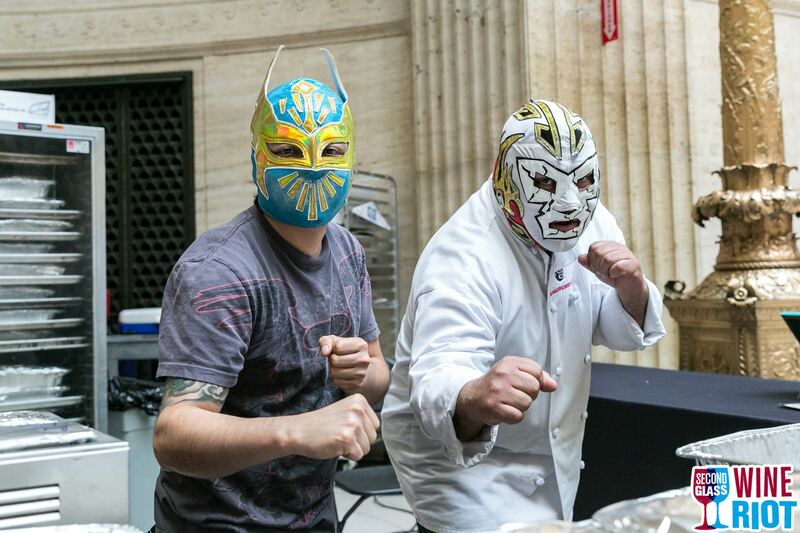 Food was available for purchase from The Slide Ride, “Chicago’s original slider truck” that’s all about delicious mini sandwiches and The Tamale Spaceship, whose delicious tamales were served up by staff wearing lucha libre wrestling masks. They also spread tamale love across the land via food truck and soon will be locating a permanent hub in WickerPark. Second Glass’s next Chicago events are Riesling Riot on June 14th and another Wine Riot this fall, October 17th to 18th.